For the Royal and Romantic Wedding Affair. 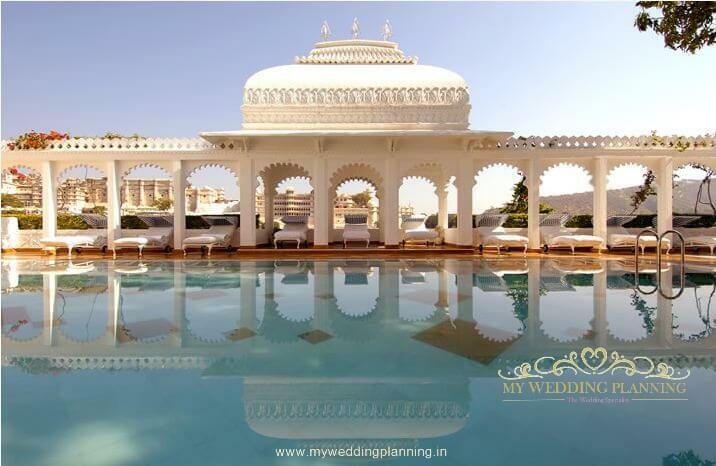 This pristine white palace, built on the equally pristine waters of Lake Pichola, was once the palace for royal parties. You could say it was untouched as well, after all, its royal butlers are descendents of the original palace retainers. With a view that allows for uninterrupted sunrises and sunsets, this hotel has the reputation of being one of the most romantic in the world. 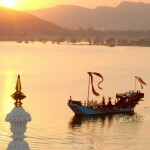 In the middle of Lake Pichola, it emerges like a giant pearl from the placid waters of the lake. It is a breathtaking combination of grand yet intricate architecture that’s withstood the winds of change. Built in 1746 by Maharana Jagat Singh II, this elegant fantasy in white marble still basks in regal splendour, complete with gurgling fountains, airy balconies, pillared enclosures, and indoor spaces filled with monuments of time. With the majestic Aravalli mountains on one side, and lofty palaces on the other, this one-of-a-kind architectural marvel seems magically afloat over four acres. 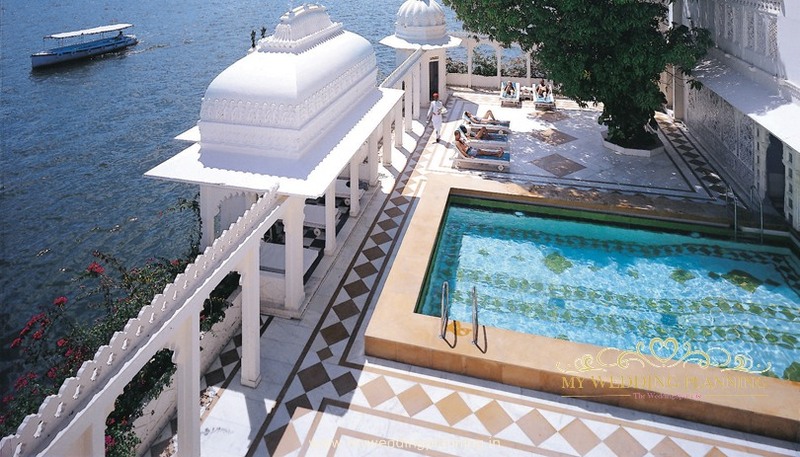 Taj lake Palace Udaipur is 26 kms away and a scenic 40 minutes drive from Udaipur airport. The Udaipur railway station is 4.5 kms away and the city centre is 1 km away, making it accessible yet in a world of its own. The palace provides seamless venues for grand occasions with some of the best views. Every venue is equipped with the latest audio-visual equipment and technology support to make the wedding affair effortless. 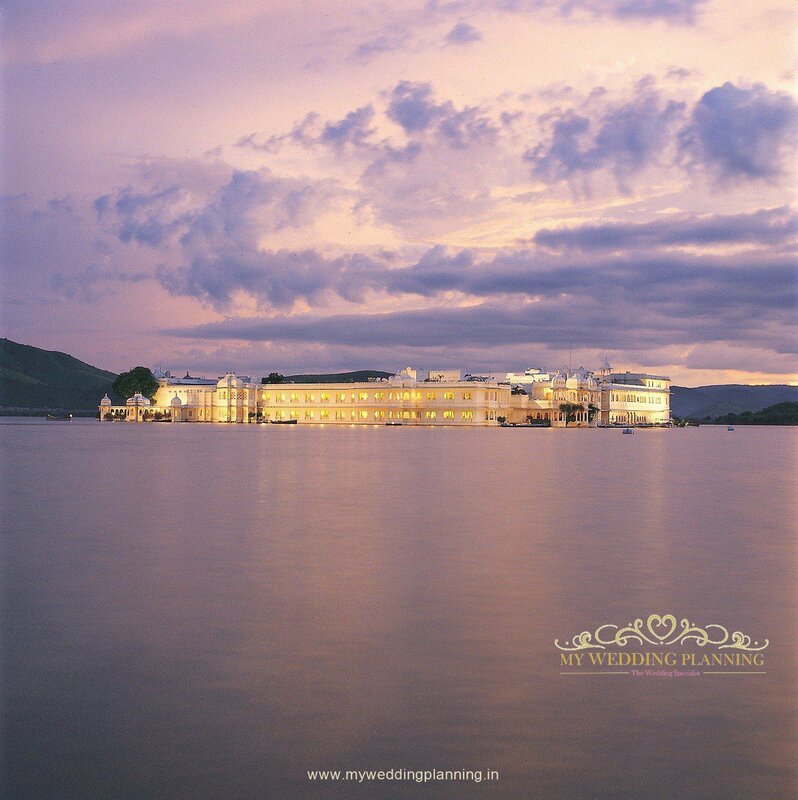 Mewar Mahal is the most beautiful wedding venue that only Taj Lake Palace can offer its prestigious and lucky guests! Be sure you have an intimate wedding with just your nearest and dearest ones attending, if you wish to get married at this surreal venue! Each room and suite in the palace is distinctly designed to capture a different mood and period. 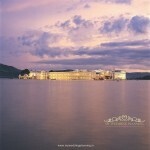 There are 83 rooms including 17 suites; each with views of Lake Pichola, Aravalli mountains, City Palace and Jag Mandir. HERITAGE WALK Allow the hotel to guide you through Tak lake Palace, bringing you an insider’s perspective on this enduring symbol f elegance and romance. 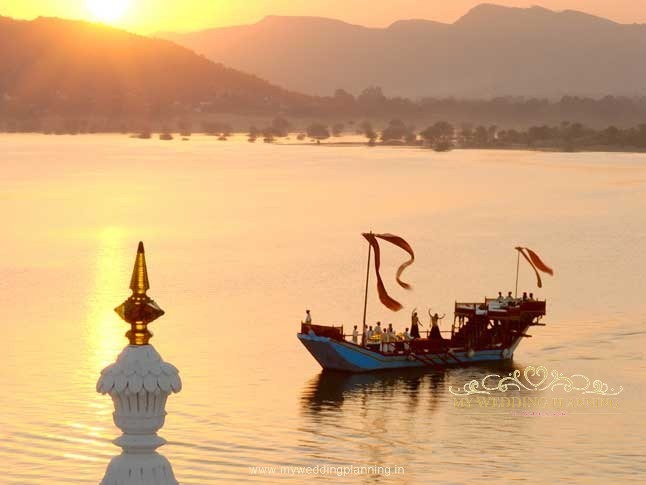 GANGAUR CRUISE The historic ceremonial imperial barge of the house of Mewar glides across the Lkae Pichola illuminated with candle light abd steered by oarsmen, dressed in resplendent costumes. VINTAGE CAR DRIVE The vintage cars recreate the magic of a bygone era. BHAIRO Let the rooftop view take you back in time to an era of royal grandeur, pomp and pageantry. Bhairo serves contemporary European cuisine. NEEL KAMAL Neel kamal boasts of a traditional ambience and views of the lily pond. Enjoy Authentic flavours of the royal cuisine of Mewar. JHAROKHA Dine under scalloped arches overlooking the serene waters of Lake Pichola. Enjoy contemporary world cuisine with Asian and Mediterranean overtones. AMRIT SAGAR Renowned for its fine selection of vintage wines, spirits and cigars , this delightful bar also serves Asian tapas. Enjoy signature experiences like heritage walks, sailing on a 150 year old ceremonial boat called Gangaur, or gliding around in the lake in the Jiva spa boat.